Its not that often that we are late to the game with many of our reviews, and I must apologize profusely for this one, but better to get it up late than never. We have moved into a new office after a rather lengthy location transition and things are just starting to get back on track. 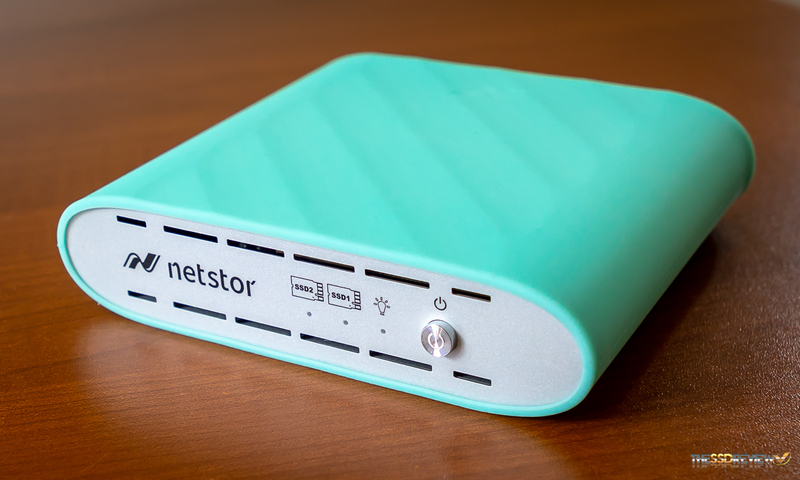 In any case, today we are reporting on the Netstor NA611TB3 Dual NVMe TB3 External enclosure…and let’s say right off the mark that this device is fast. But then again, Thunderbolt 3 pushing through the Type-C adapter is just now becoming commonplace in the tech industry, allowing this device to move data at 40Gbps. 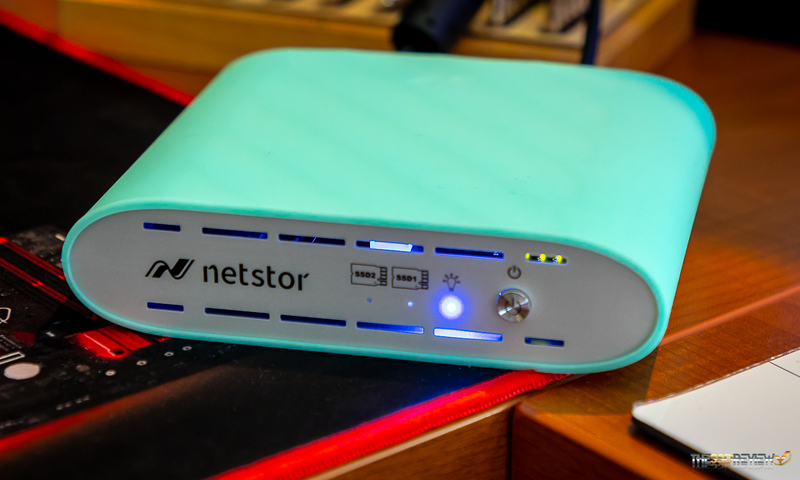 The Netstor NA611TB3 enclosure does not come with SSDs, however, has full capability of reaching top TB3 performance at 2.8GB/s with the inclusion of two NVMe SSDs. 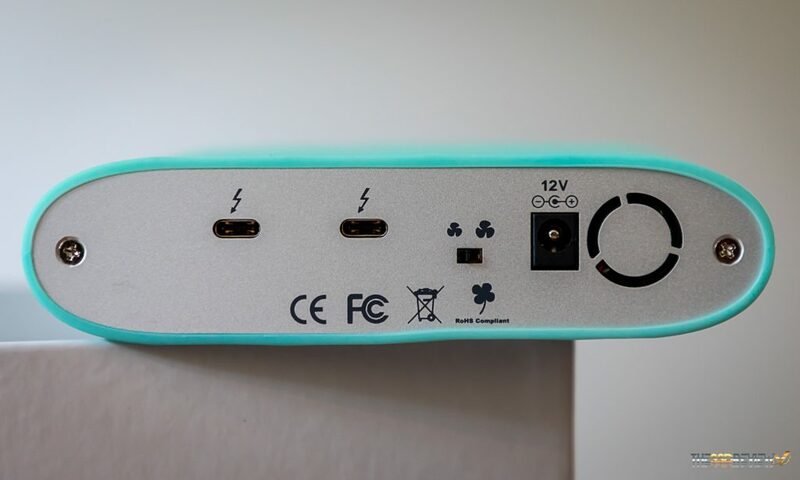 It has a power switch on the front, has dual speed fans that are switchable for active cooling, has dual TB3 ports for daisy chaining up to 6 devices, comes with a two year warranty along with a power adapter and Thunderbolt 3 Type-C capable of full TB3 performance. 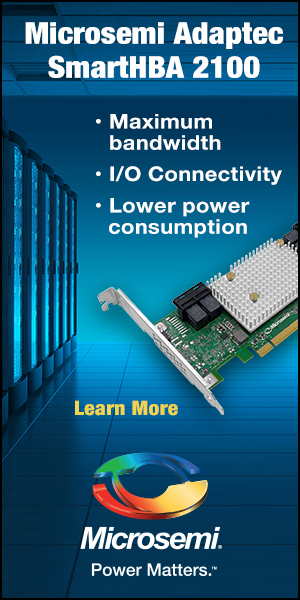 For the enclosure itself, pricing can be found above the $300 mark which can get a bit high when you throw in two NVMe SSDs. Looking at the positive side of things, consider the fact that this enclosure can store up to 4TB of data with the right capacity SSDs. Check out prices at Amazon. With respect to product build, the enclosure itself is of a rounded aluminum casing with a green blue skin on the exterior. 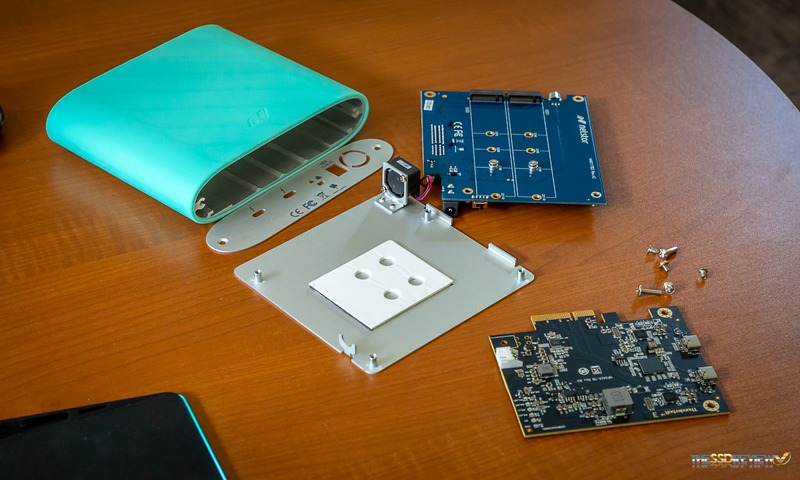 It can be disassembled by removal of the two screws on the back, sliding out the three attached boardss and disassembling each in order to install the SSDs. 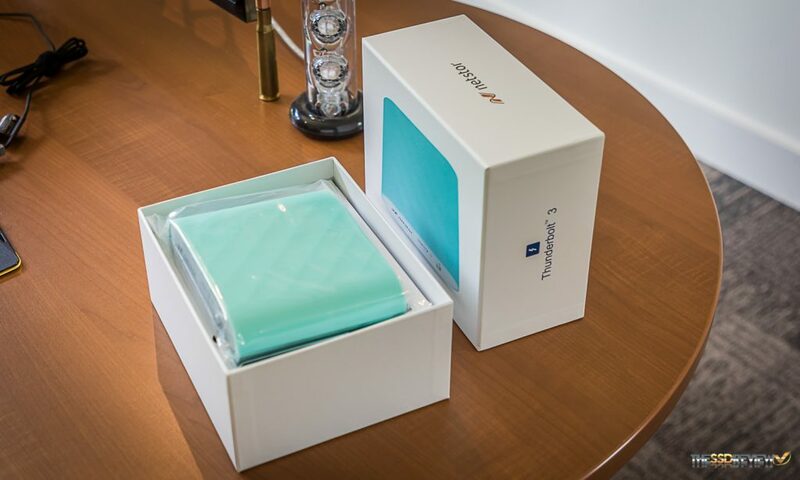 Although disassembly of the device is rather easy for reviewers and tech savvy people, we are not so sure that this would fall into the zone of comfort for many. 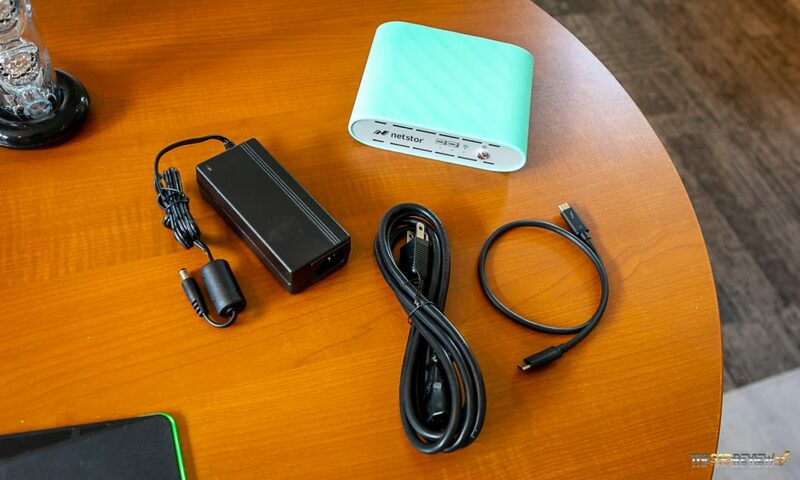 To help, Netstor has compiled a great video which can help out with installation and can be found here. When the unit is powered on, You will see a blue light for power or orange for stand-bye. 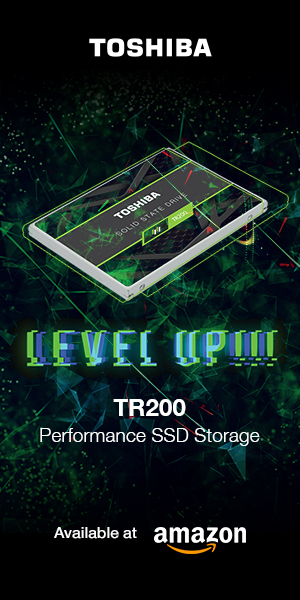 There is a white flashing light for each SSD that flashes when there is activity for that respective SSD.